Whatever your field of work, we all lack a little motivation or inspiration sometimes. The truth is, it's nearly impossible to stay creative and inspired at all times. And sometimes regaining inspiration can be as simple as going for a walk, working from a new location, or simply reading one of your favorite quotes. Thanks to the age of social media, inspirational quotes are easy to find. And, if you would like to create your own, we've curated a list of 50 inspirational quote examples to help you design your own. Read on for 50 pieces of motivation and awesome designs to get you out of your slump and raring to go. A lot of motivational posters tell you to balance work and play, but as this beautiful illustrated quote by Shauna Lynn Panczyszyn notes, why should work and play be separate at all? Executed on a tricky medium (chalkboards) with an even trickier tool (chalk) and with no help of undo buttons, Shauna Lynn Panczyszyn combines stunning letterforms with simple and beautiful illustrative elements to create a design that brings life to Mary Oliver’s words. Sometimes it’s nice to just be greeted with a few nice words in the morning, and maybe a few flowers too. This typographical piece from Antonio Rodrigues Jr. originally began as a series of greeting cards but has since been featured in galleries and all across the internet. The design combines bold type with beautiful graphic elements, creating a strong sense of depth and a truly inviting and uplifting design. “Cards” by Antonio Rodrigues Jr. When the going gets tough, the tough get going. Stay motivated to stay tough and keep going with this intricate and detailed typographic piece from Like Minded Studio. Part of a series of other amazing typographic posters and cards, this design uses extremely detailed illustrative elements and a simple but effective palette to create a well-balanced and eye-catching design that certainly does not look easy. If you recognize this stylised hand-crafted type, it’s probably because you’ve likely seen work from illustrator Mary Kate McDevitt somewhere before. McDevitt’s typographical and illustrative works have been featured by groups such as Target and Penguin Books right through to Sesame Street, this piece having been created as a part of a mini-documentary on her work. McDevitt’s work is equal parts fun, quirky, eye-catching and balanced, and this magical piece is definitely no exception. When interviewed in 2010 by Humble Pied, designer Jessica Hische coined the very quote used in this example. As she explains “This quote seemed to really ring true for a lot of people (and not just designers)”, so who better to turn it into a typographical poster than Hische herself? This design manages to be both classy and fun, with elegant gold gradients and soft blues, Hische has managed to do her own words justice. Hard work is by nature never easy, that’s no secret, but it is rewarding, so stay motivated to do an honest day’s work with this classic poster. Just as the designer of this piece Nathan Yoder explains, the design was inspired by “some good o’l fashion Americana”, particularly the old Saturday Evening Post covers. With a touch of the red white and blue, a hint of nostalgia and some excellently crafted type reminiscent of traditional sign painting, this poster makes a hard day’s work just that little bit easier. Appropriately displayed a mirrored background, this quote from Bertolt Brecht has been done justice with a beautifully designed typographical treatment. Another prolific designer (with clients from Coca Cola through to Oprah Magazine) Ricardo Gonzalez handcrafted the elegant brush type before printing it onto the mirrored card to put a nice extra piece of emphasis on the beautifully-set words. This matchbook reminder by MUTI serves as a handy prompt to keep your priorities in check and not overburden yourself with the unnecessary things. Designed as a part of a group show at an exhibition “themed around custom typography and signage”, this design is a part of a series of wonderful pieces that blend illustration and lettering seamlessly to create fun and striking designs. A lot of the time, success is an uphill battle, but it just makes the final destination that much more worth it. This poster by Victoria and Vitalina Lopukhiny is part of a series of posters, branding and overall design for a business school, “Yappi”, so it makes sense that the quote should be set in a motivating light. A simple graphic and bold, custom type brings the words to life and enhances the meaning without overcomplicating or overwhelming the design. A poster that practices what it preaches. We’ve all heard those charming startup stories, where a few friends dreamed and schemed in a bar, plotting ideas out on napkins only to turn those ideas into billion dollar ideas. The reason we love these stories so much is that they remind us that everyone started out with nothing but an idea. This idea has been beautifully pinpointed and illustrated by Shauna Lynn Panczyszyn with clever use of blurred/water-damaged edges and minimal graphics. A simple and sweet reminder that all ideas start small, it’s just your task to take them big. Procrastinating is easy, actually doing is the tricky part. This typographical piece combines large, stylised and dimensional type with smaller, thinner elements and type to create a balanced and harmonious design. This piece is a part of a long-running project from Berlin designer Martina Flor called “Letter Collections” where she says she will be using customized postcards to “(get) in touch with people I always wanted to reach or simply people I miss”. A good dose of passion can make life fuller and art stronger, so stay reminded to seek passion in all aspects of life with this striking poster by Georgia Hill. A sleek blend of hand-rendered sans-serif type with more stylised, firey type and visuals and a strict monochromatic color scheme makes for an eye-catching design that visualizes the words in a unique and effective way. It’s an easy and common mistake to assume that creativity is inherent and born out of thin air. In reality, just as this brilliant design by Peter Bielous reminds us, creativity is a little more planned and thought-out than that, it’s a careful process. This design is detailed and meticulously created, from each letter to every decorative element, they all work together to create a stunning piece. Bielous also pinpoints the quote’s message when we describe this very piece as having taken a careful factory line of process, “It was 5 days long process a lot of sketching, drawing and this is the result.” So, don’t knock the process, because it quite evidently produces stellar works. You never get a second chance to make a first impression, but the chance to leave a big mark is always open. This punchy typographical poster by Brooklyn-based letterer and illustrator Mary Kate McDevitt uses bold hand-crafted type and a striking black and white color scheme to make for a beautiful typographic design. There’s the saying “good things come to those who wait”, but a more appropriate saying would be “good things come to those who work hard”. Put much more eloquently than that, however, is this quote from Steve Jobs, as designed by MUTI. The custom lettering, stylistic distressed texture and vibrant color scheme are what make this design something special. A beautifully and uniquely designed poster that is certain to remind you to keep working hard in order to make your own luck. 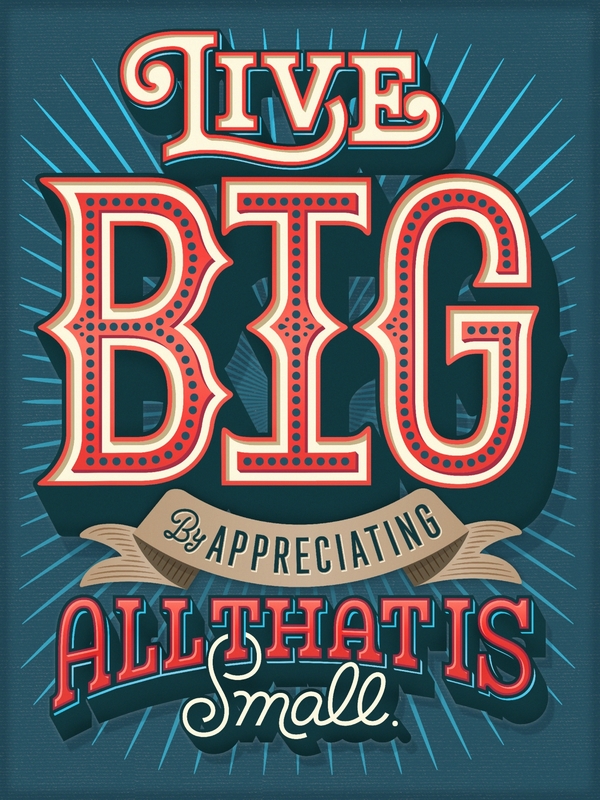 Designer and typographer Rob Draper is definitely a show-off. Not only does he create stunningly detailed and beautiful typographic pieces, but he also displays them on the craziest of mediums. ‘I have always been fascinated with the contrast of creating something of great detail on something so disposable and valueless,’ Draper said in a Daily Mail interview. “I really like the juxtaposition of the lettering itself, which I hope is beautiful, and the materials used which are disposable” everyday objects. A simple message of “create more” is given new and stronger meaning by Draper in this piece that puts a beautifully crafted piece of type on top of small Ikea pencils, proving that there’s really no excuses to not create. Inspiration is the best form of motivation in many cases, but often the only time it’ll strike is when you’re already underway. Picasso spoke about it, and Kate Pullen immortalized it. As a part of a commission from AIGA, Melbourne-based designer Kate Pullen created this simple but emotive typographical piece that brings a new vibrant personality to Picasso’s words. The contrast between the flowy and cheerful type with the simpler block letters creates a beautiful balance that is sure to inspire you to get to work. In a world where experimental creativity seems to be king, illustrator Stephanie Baxter (also known as “Steph Says Hello”) uses yet another set of Picasso’s words to illustrate how even the most experimental artists need to learn the ropes. Created initially with pen and paper, Baxter has created perfectly unique letterforms that suit the subject wonderfully—a beautiful juxtaposition of straight, linear, simple type with more vibrant, expressive and colored type helps to highlight the meaning of Picasso’s musings. Finding something you are truly passionate about is not always the easiest thing, so when you do find it, hold onto it tight. These wise words by French chef Julia Child are a perfect reminder to keep the passion and interest in hobbies, skills, activities and certain things alive in you at all times. And these beautiful words are complemented with a beautiful design by Lindsay Whitehead. Fresh, cheerful colors, dainty floral illustrations, and well-crafted letterforms make it easy to get passionate about this poster. A simple gardening analogy that can apply to just about anyone in any specialty. Stay reminded to keep working, keep pruning and keep your metaphorical garden sharp and neat with this typographical poster from Andrew Power. This design only acts as further proof that when creating illustrations to compliment typography, they don’t have to be intensely detailed to be effective. Powers has drawn inspiration from the quote and has included illustrative elements in the form of stems, leaves and berries growing out from each letter. Just the addition of fine lines and simple shapes takes his design to a new level. Failure is undoubtedly one of the worst feelings, it’s disheartening and discouraging, but at least failure proves you are trying. This effective typographical piece by Travis Pietsch reminds us to not be afraid of failure through a combination of detailed hand-crafted script and serif typefaces. Pietsch’s letter forms are described as equal parts “quirky, organic, & rustic”, which is what makes his design unique and effective. True amongst all disciplines, from writing to art, to even our daily communications, the pen and written word (or drawn image) truly have infinite power. Stay motivated and inspired to put pen to paper with this poster by Chris Hood. Created as a part of the 2012 London Compare Contrast Exhibition, Hood notes “The brief was very simple and open: ‘create a piece that puts across your interpretation of Compare or Contrast,’” He says, “Bearing this in mind, I chose to have a go at interpreting the old adage “the pen is mightier than the sword”. Simple, punchy black type paired with a clever red and yellow illustration of a pen/sword makes for a balanced and engaging design that fills the brief and acts as a good source of inspiration. Whatever way you do it, exploration and taking risks is the only way we make real progress, just as this poster by Justin Poulter reminds us. Having worked with high profile clients such as Coca Cola, Reebok and Nike, Poulter definitely has the design game figured out, as can be seen in his highly effective typographic piece that was created for distribution in a small apparel company. The use of strong blacks and vibrant purples make this design unique and bring movement and life to it, perfect for the medium. The choice of travel-related icons and imagery complements the type by being executed in a similar way. Overall, a sleek but fun design. This quote and typographic piece is definitely for all the detail-oriented people out there. A simple reminder to take note and appreciation for the small things, whether this is in day-to-day life or in your profession. This typographic piece by Erik Marinovich clearly practices what it preaches by displaying blocks of type that have clear attention to detail. From the way each letter is shaped, to the shadows and highlights, gradients and textures throughout the entire piece, Marinovich has created a big piece of type that pays attention to the small things. If an idea has no hard work behind it, then it remains just an idea. Get inspired to bring your idea out of your mind and into reality with this poster by Nate Williams for Scholastic. This patchwork quilt-like typographic design combines many different styles and kinds of type in a fun and intriguing way. The vibrant color scheme, doodled illustrations, and patterned type make this piece stand out from the rest, and certain to catch just about any eye. On the topic of making ideas real through hard work comes this piece by Emiliano Aranguren that uses a Thomas Edison quote to highlight the importance of pursuing and executing those ideas before they slip away. This design is a part of a personal project that captures a series of famous quotes in very effective typographic and illustrative designs that highlight the theme of each piece. It doesn’t take long to realize that learning doesn’t end when you leave the classroom. Encourage yourself to embrace all learning opportunities with this beautiful typographic piece by Kavan & Co., headed by illustrator Matthew Kavan Brooks who intends each piece to be “designed to become a compass bearing to lead us to the better things in life, providing a moment to reflect and bring clarity.” And that’s exactly what it does, with a combination of beautifully rendered type and a cluster of visual elements, this piece is an example to learn from in itself! “A Beautiful Mind” by Kavan & Co. The beauty of this piece is the flexible meaning – do good work, produce good things and also do good in your day-to-day, be kind and a good human being. Whatever good you choose to do, let this clever and effective poster by Fifty Five Hi’s guide you. Ross Moody (the designer behind Fifty Five Hi’s) has created a well-aligned piece of type that is playful with letterforms and shapes to make for a unique spin on such a simple piece of advice. Just like learning to ride a bike, life can get shaky and tricky at times, but keeping at it and finding your balance makes the whole lot that little bit easier. These words about balance and bikes come from Albert Einstein, and the stunning poster they are written on come from Telegramme Paper Co. who specialize in mid-century and vintage-inspired designs as is fairly evident in this poster. Vibrant oranges, lively type, and simple graphic elements make for an eye-catching and very engaging design. “Bike Quote” by Telegramme Paper Co.
It’s a good thing to remember that if we keep waiting to reach the destination, we forget to make the most out of the journey. This poster by Gina Grittner reminds us to sit back and enjoy the ride. Grittner explains the meaning behind the analogy as “Creativity starts with an idea. It starts to morph into something more when it’s expanded on through brainstorming or a nearly illegible sketch. That’s where a great end result comes from—a long journey of throwing away bad ideas and generating new great ones,” She says, “It’s not just about the final, beautiful, end result. Creativity is a labor of love and persistence. It truly is about the journey as much as the outcome. And a bold, warm and hand-crafted piece of type and illustration puts a nice emphasis on this idea. Inspiration and motivation come at the strangest of times, so be sure to pounce on them when you can and make the most out of any sudden burst of energy. This poster (once again by the talented Mary Kate McDevitt) puts a rhetorical spin on the phrase ‘strike while the iron is hot’ and an effective spin on the type design. A contrast of warm and cool colors, sharp and softer illustrated type and some fitting illustrative elements make this poster a fantastic piece of motivation. Curiosity supposedly killed the cat, but it can work to keep your creativity and thirst for exploration alive. This sharp typographic and illustrative poster by New York/Beijing-residing designer Duncan Sham visualizes this piece of wisdom in a clear and abundantly effective way. With a mainly monochromatic design, with just a few hints of gold, this poster ties itself together with a host of illustrations that flow beautifully throughout the piece. A sharp and engaging design that is hard to not be motivated by. Oftentimes we are our own worst critic, we point out flaws in our work like it’s our job. And while sometimes identifying flaws is a part of our job, finding a remedy for them is an even bigger part. This piece is a commission work by Tristan Kromopawiro, an Amsterdam-based designer with a clear flair for hand lettering and motivational words. Kromopawiro’s combination of tall typefaces with hand-lettered ones creates a strong hierarchy and a brilliant sense of contrast. A great little reminder that when analyzing our own work (as well as others’) we should always consider a possible solution to any faults we encounter. If you recognize these words from somewhere, that’s likely because they are the motto of academic research database Google Scholar. Just as Isaac Newton noted, a key to success lies in an understanding and appreciation of others’ work and letting it propel your own work. These wise words by Newton have been done justice with a detailed and beautiful piece of type and illustration. Roberlan Borges, a Brazilian designer “with a penchant for vintage stuff, old adverts, pinups and all crazy things” has created a stunning and engrossing poster that is jam-packed with detail and beautiful visuals. With a vintage-inspired palette, lettering with even more attention to detail, and strong, bold lines in all the illustrations, Borges has created a piece that could certainly be classed as a giant. One of the great design-based sins is a bad kerning job, such an easily avoidable but easily made error. So, learn to care and learn to kern, and take inspiration to do just this with this poster by LA-based designer Drew Melton. Originally crafted by hand (as is Melton’s specialty) each letterform is smooth, sharp and of course, kerned well, making for a beautiful piece of type. Remember to treat your type with the utmost care, and you may just achieve a piece as well-crafted as this one. Any venture is made up of successes and failures, the key is not letting the lows take away from the highs. This poster by designer Scott Neilson visualizes the feeling of failure and the recovery from failure simply with type, by shattering the letters and then slowly piecing them back together. With a simple monochromatic palette, typeface, and idea Neilson has showcased a complex life experience with a straightforward and clever design. Without even using any accompanying illustration, this poster is just further proof of the power of type when it’s put in the right hands. Optimism is a special tool, available to everyone and a source of limitless inspiration and motivation, as is this poster by Washington-based designer Karli Ingersoll. Ingersoll herself notes how optimism drives her own design “Using my skills to better the world even in small ways is a big part of who I am and what drives me to design” a value that is quite clear in this beautiful and positive piece of hand lettering. Waking up with a good attitude and a positive outlook is a hugely beneficial tool. It’s an old phrase because it makes so much sense – when life gives you lemons, make lemonade, make the most of out of the hand you’re dealt. This attractive piece of hand-lettered typography created by Brooklyn-based designer Lauren Hom was a part of the group exhibition “Found In Translation” that asked 22 Korean and 22 Western artists to each create a typographical poster that “(sheds) light on the cultural similarities and differences between Korean and English speaking countries.” This piece by Hom had a counterpart by Moon Seok Oh that read “You can turn misfortune into good fortune”. A beautiful, vibrant typographical poster with a piece of advice that spans across cultures and languages makes for a brilliant bit of inspiration. The most troubling of times can sometimes show us just how tough and resilient we are. This goes for creative and professional ventures as well, how we operate under pressure and error can say a lot about us, so seek out that ‘invincible summer’ within yourself. And what better way to seek it out than with this beautiful quote, originally from author Albert Camus, that has been immortalized by Kavan & Co. Through gorgeous handcrafted typography and beautiful floral graphics, Kavan & Co. have created a beautiful design that makes it just that little bit easier to wait out the coldest of winters. “The Invincible Summer” by Kavan & Co. The journey and process toward any goal can be hard, time consuming and can sometimes feel worthless, but a lot of the time, the harder you work, the better it feels when you reach that final result. This idea is captured fantastically in this lively and exciting typographical poster by Australian designer Gemma O’Brien. The incorporation of the arrows and target into the piece enhances the meaning behind the words, which are each crafted beautifully with an engrossing attention to detail. Aim high and if you miss, just reload and re-aim. Many human beings by nature like to connect with things, particularly ideas. They can sit in a room and be dealt facts until the cows come home, but if you engage and connect with them, you can ‘enthrall them with story’. Introducing that little bit of compassionate connection can give your work, your pitch, your goals that extra added boost. Get inspired to begin crafting a story with this vibrant poster by Kate Moross. Originally designed as a part of a series of typographical illustrations for Nokia, Moross has handcrafted this colorful and full-of-character type piece. The vibrant color scheme, bright patterns and sharp contrast with the black background make for a stunning piece of work that is most definitely enthralling. There will always be a few bumps in the road, but a road without any bumps doesn’t tend to get anywhere great. Learn to expect, tolerate and deal with those bumps with this poster from Sevenly that visualizes the words of Frederick Douglass. With unique handcrafted lettering, some vintage-inspired graphics and a rustic feel to it, this poster has a distinctly personal and individual touch to it that is sure to motivate you to push past those struggles. Creating and experiencing art can sometimes feel as though we are adding life to the duller days, washing away the dust from everyday life as it were. So, give your soul a well-deserved dusting-off with this beautiful piece of art by Peter Bielous. Inspired to create this piece by simply discovering the Picasso quote in question, Bielous has ensured that each letter in this piece is crafted with care and attention to detail, with each word slotting into place to create a sharp and sleek final product. This piece has depth and a strong sense of hierarchy, even with the simple flat black and white design, complementing Picasso’s musings beautifully. A set goal no matter how specific or generalized is a key to getting on the right path to success. This typographical piece was incredibly created with chalk on a chalkboard by designer Scott Biersack who makes note of his goals as being “As the quote says, I want to work so hard that one day my signature will be called an autograph. I have some big hopes and dreams of becoming an ADC Young Gun and with hard work and determination, I know I can achieve this. I resolve to work hard.” And work hard he does, as is clear with this beautiful piece of type, an interesting combination of script and serif type, each line shaped in an intriguing way. So, whether your goals are specific or fairly open, chase them with all you have. One of the biggest lies we often tell ourselves is “I can’t do that yet, I don’t have everything I need”, but Theodore Roosevelt is here to tell you otherwise. This piece is one part of a set of 10 calendar pages designed by husband and wife duo Joel and Ashley Selby, owners of This Paper Ship. The page captures Roosevelt’s words with both illustration and simple yet effective typography to make for a fun and inviting design, sure to encourage even the most unmotivated of us. So, instead of making plans to stock up with more tools, take this advice and simply begin where you are. Keeping your mind open is a good way to let new things into it. This poster by Connecticut-based designer Jay Roeder uses bold hand lettering and illustration as is his specialty. The non-linear, shapely and irregular letterforms give the piece a unique flair to it and a stronger sense of handcrafting. So, be sure to stay receptive to new ideas, open to new challenges and understanding of any changes you may face, and keep your mind always open. Perfection is a word people developed to describe something that is entirely without flaw, but for everyone who has asked for (or simply just received) feedback and criticism from others’ would know that there is always something somebody will not like, or that can be changed, fixed, altered. Salvador Dali, author of these words, knew how impossible perfection was, and he went on to make a name for himself as somebody who challenged the ‘perfect image’. This piece of type by Travis Pietsch beautifully complements this quote, with unique letterforms, swashes that tie each word to the last, and a vintage-inspired palette. Perfection is a wonderful thing in theory, but is impossible in practice, so while you can chase it all you like, don’t feel dejected when you can’t quite achieve it. On the bright side, if your idea turns out well, you have had a good idea, on the slightly dimmer side, if your idea turns out not-so-well, you’ll have a brilliant story to tell (and probably a memorable lessonlearnedt). This piece by Californian letterer Joanna Muñoz (also known as “Wink & Wonder”) reminds us to not condemn our bad ideas, but learn from them and appreciate the anecdotes, lessons and value they supply us with. A beautiful piece of very simple type and illustrations to convey a very simple message.